A few years ago we got a free go-cart because our neighbors were moving and didn’t want to take it with them. The go-cart had no engine, but my husband bought an engine and put it on the go-cart. The kids had fun with it for a short while, but the chain kept coming off. 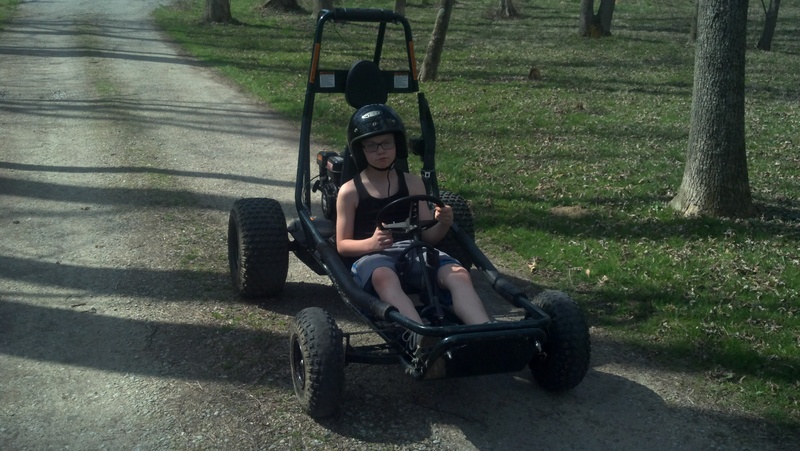 We replaced and repaired the chain, but the go-cart had a rigid suspension and on bumpy land, it would throw the chain off. After many, many times of putting the chain back on, it really wasn’t fun any more. Each ride ended too soon with the chain off. The enjoyment was short-lived. Since the go-cart wasn’t much fun and I needed an engine for our roto tiller, I won out and we put it on the roto tiller. It works well and the kids have been mad ever since. They are always complaining about it to this day! Fast forward to today. We had a neighbor who put his go-cart up for sale. 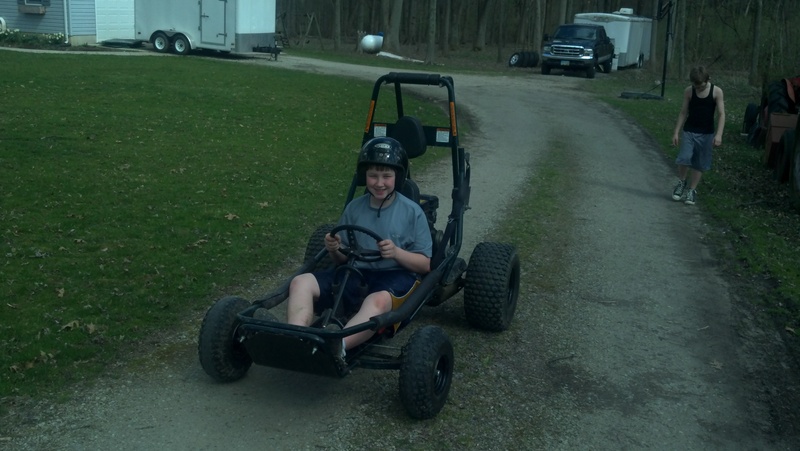 $300 for his used go-cart. My kids were super excited. Since we had that free go-cart a couple of years ago, we knew what we were looking for with the suspension, the engine to start easily, and that the oil looked good. We also found out why he was getting rid of it and the reasons were that he was getting too big (he’s 17) and that their grass is on the wet side and it tears up the grass. We have plenty of acreage, so our kids don’t need to ride in the mowed part of the yard. Also, since he had a helmet that he used when riding, he threw it in with the deal. We bought it used and saved $1200 over the price of a new go-cart that the kids were always talking about buying. We considered buying a new one a couple of times, but couldn’t part with the money. Buying used can save a bundle. We would normally negotiate to get a lower price, but he was a nice young man, and he threw in the helmet, and he had a fair price on the go-cart, that we didn’t push the price. The kids don’t care whether it is new or used, they are just glad to get to ride it! This is linked to Frugal Tuesday Tip. We have a son, T, who is 10. He has worn glasses since he was 19 months old. His eyes were fine up to 17 months old and then one day his eyes weren’t following at the same speed. Within a week, his eye was turned in to the corner and didn’t come out until we got his glasses. We got the referral from the Pediatrician right away, but we had to wait to get in to the Opthamologist. This was the hardest 2 months ever. Once we got the glasses, I thought all of our problems would be over. WRONG. First, he wouldn’t leave them on…because he wasn’t even two…then he finally realized that he could see with them which was good. But then we would find him without the glasses and have no idea where the glasses were. He usually wasn’t any help in finding them. We had enough sense to buy the insurance which covered breakage, but not loss. We LOST several pair because he took them off and set them down somewhere and couldn’t remember where. He lost a pair out in our woods. He even ate the nose pieces off of the glasses for a while. After the losing them phase, we have had the ” rough, tough, boy” stage where he is super rough with them. He has broken several pair. The latest break was 2 weeks ago. The insurance covered the break, and all we had to pay was $20 for the front section of the glasses. Otherwise since the glasses were over a year old, we would have had to buy a whole new set of frames. We never buy the extra insurance on TV’s, electronics, etc. But having a boy who wears glasses full time (only takes them off to sleep) has made me glad to have the insurance. I’m sure every situation is different, but it has been a blessing for us! 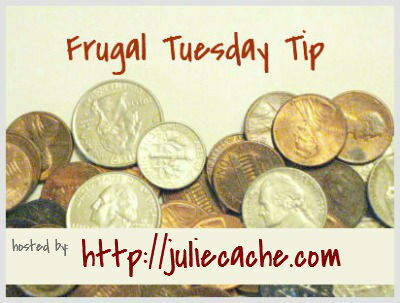 This post is linked to Frugal Tuesday Tip. I like to think that we are pretty good with our money. My husband has an MBA in finance and he has taught me the key principles in money management. Some of the ideas come pretty easily to me, some are harder. I am amazed how whenever my husband and I go over certain topics involving money my thinking goes back to when I was a kid growing up. We grew up with completely different ways of thinking about money. How we are raised with money affects us. We follow Dave Ramsey’s ideas for the most part. We bought Financial Peace and the whole CD and DVD set. My tip is to talk to your kids about money. We have been watching the Financial Peace University DVD’s for 30 minutes each Sunday evening. We put it on the schedule…it’s that important. We have had some interesting discussions with our children. Dave Ramsey is entertaining while still getting his point across. If there is something we want to discuss further, we can pause the DVDs and have an open discussion about the current theme. Money is something we should talk about. Sometimes I think it is good for our children to hear what like minded people have to say. Sometimes I think they get tired of hearing from us about the same subjects over and over. This has given them a fresh outlook on the same sort of principles. The more you talk, the more opportunities your children get to listen and communicate what they are thinking. This can help them own their beliefs and be a stronger advocate for what they believe and rebuke the lies and inconsistencies that are out there surrounding money. We have a larger family and an average sized home. We have a lot of stuff, but not a lot of space. My tip is to get the things that you use daily organized. For example our laundry room is right off of the garage, so it has become the dumping ground for backpacks, coats, musical instruments etc. The children use the most of these things daily or multiple times each week. 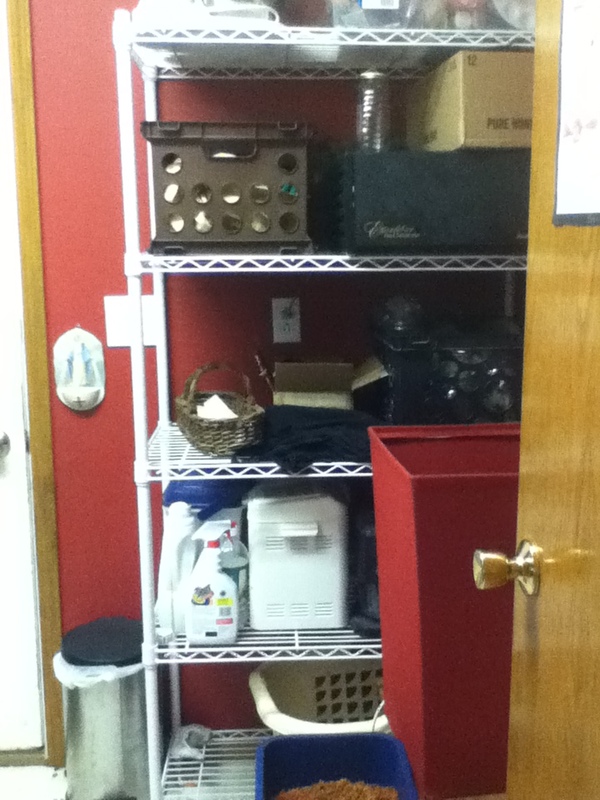 I have a wire rack in there that I put all of my kitchen overflow items and extra laundry supplies. These are things that I don’t have space for, or appliance that I don’t want on the counter, or things I don’t use that often. My son had to do a family project for scouts and I thought that the laundry room could be a lot more efficient. Of course his solution was to get rid of my things off of the shelf and put the kids stuff there. I hated the idea at first. Why is it always my stuff that needs to go? Sometimes, that is how it seems! I thought about it for a while, and he is right. I don’t use that stuff frequently enough to justify taking up valuable shelf space in our cramped room. 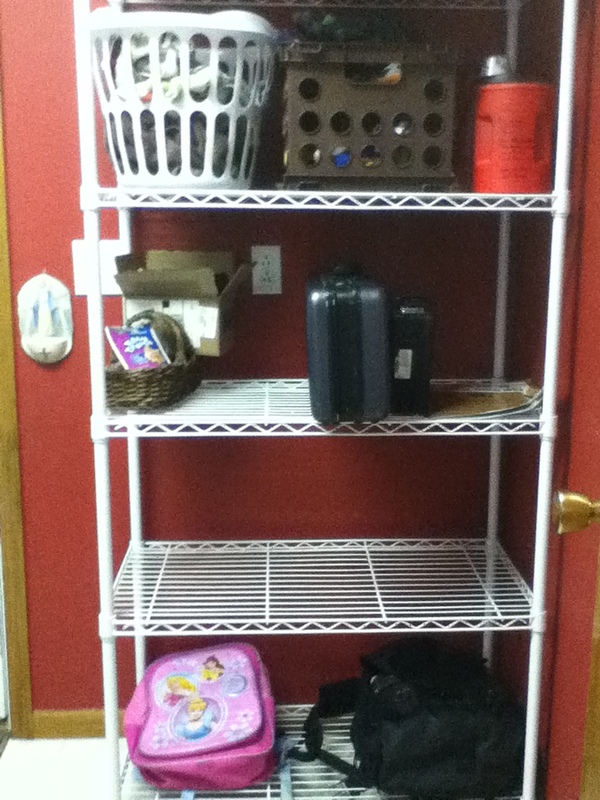 Shelf-- after photo-kids backpacks are with them at school! He cleared all of the shelves and claimed the bottom 2 shelves for kids backpacks and the middle shelf for musical instruments. We moved some things around and getting all of the backpacks and musical instruments off of the floor has mad a big difference. All of my items are in the basement on a shelf that we had just cleared off. It makes sense to have these out of the way, but still easily accessible. Look at your problem areas with fresh eyes. My son didn’t worry about hurting my feelings, he looked at efficiency in the space and I am thankful for that! This is linked to Frugal Tip Tuesday. When I received my water bill last month, I was a little concerned. It is normally about $37, and this bill was about $45. My guard was up, but with 6 kids, laundry, cooking, cleaning, baths, etc. I thought it could be just a fluctuation. Fast forward another month and the bill was $62. I knew we had a leak somewhere. I checked all of the toilets, no problems. Fixed faucet that is no longer dripping! My search led me outside to the hose faucets. BINGO. The faucet had a slight leak and water that we are paying for was dripping into the ground. 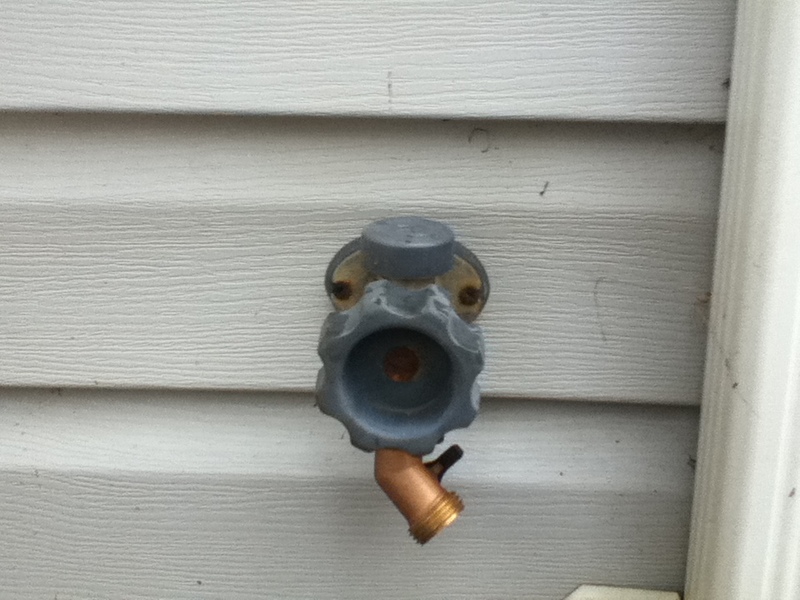 I went to the hardware store and bought a shut-off valve, and for about $5, I was able to stop that leak. It appears through the billing amount that the leak had just started towards the end of the first billing cycle that was higher than I expected or that the leak was gradually getting worse. I don’t know which, but I do know that knowing what you are expecting your bills to be helps when it comes to problems. This is only a temporary fix, but it will work until the weather warms up. The whole unit needs to be replaced, but it is a big job. I know because we already had to do it to our hose faucet out back. Bummer! If I didn’t know what my bill should have been, I might have missed it for another month or two, which would have wasted even more water and money. Know your numbers, it will help your wallet! I have several funnels in a basket in my pantry. I use them to stretch my supplies to the max. I have found the best funnels in the auto parts department at the parts store and at a dollar type store. I have several different varieties. 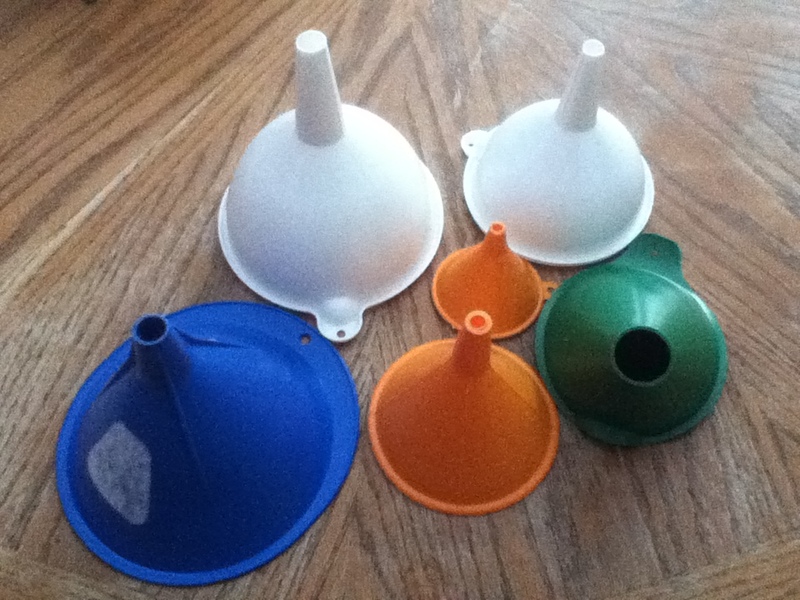 Some hold a lot in the funnel, some that are more of a “chute” type. Some with small openings, some with large. I like to use them for different condiments. Ketchup needs a larger funnel opening as it is thicker. Mustard needs a smaller funnel end as the opening is smaller on the bottle that I use. 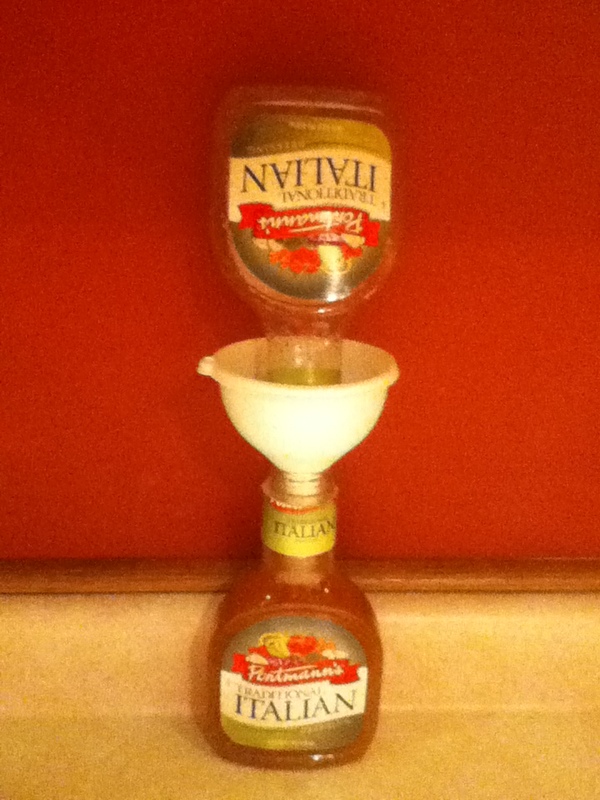 I like to let them stay upside down for about an hour to get all that I can from the old bottle. Using every bit of your supplies helps to get an extra serving or two from each ingredient, which helps stretch your money and budget! This post is linked to Frugal Tip Tuesday. Our house is cold upstairs in the winter . Our children sleep upstairs. We have an oil heater in each of the 2 bedrooms up there to help with this problem. For a while we tried to get the children to remember to turn them off. It would be someone’s “job” to turn them off each morning. I noticed over time, that the job wasn’t getting done, more than it was getting done. Problem. We were wasting energy and money! 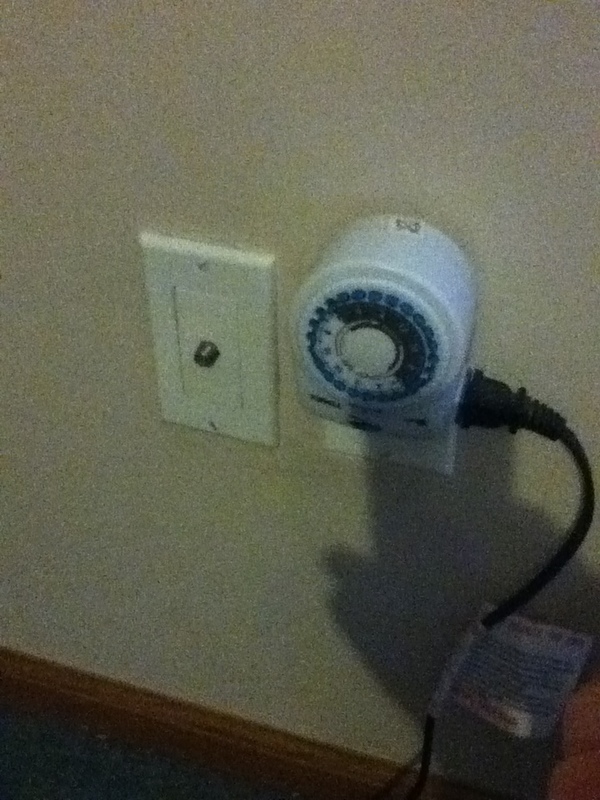 My husband came up with the idea to put the heaters on a timer. What a great idea! It has a double benefit. The heaters take a while to get warm and a while to cool down. We set the timers to turn on an hour before bedtime and it is warm when they go to bed, and they shut off an hour before they wake up so that we aren’t unnecessarily heating the room when they aren’t up there. We use the heat wisely. No need to remember to turn them off. Also if someone won’t be sleeping in the room, for a sleepover or such, we unplug the heater, but leave the timer plugged into the wall. 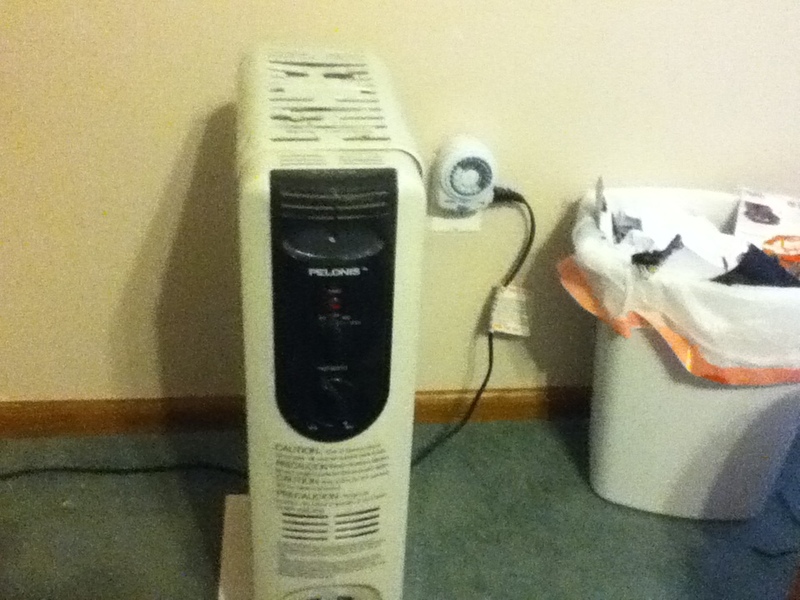 When the room is being used again, we plug the heater back into the timer, and it is still set as before!